is because of the number of song files in this library. using the yellow arrows to the left of this text. head and whirls it towards his target. he can only throw one at a time. Guts Man was made to lift and transport huge boulders. loose bricks and boulders to fall from ceilings. melt and mold metals; that is, until after being reprogrammed. 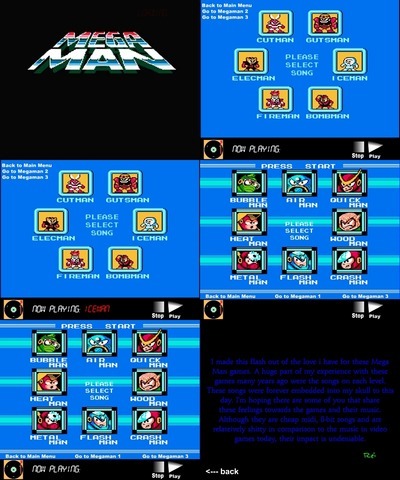 patterns to confuse Mega Man. still remains one of the strongest of all robot bosses. frozen Mega Man, to inflict more damage. Finishing him off fast is a must. back with a similar dosage of firepower—mainly metal blades. The master of the skies, Air Man is truly a master of his element. Without the proper weapon, fighting him can be a nightmare. his pattern, it's still easier said than done. shot, without the right weapon, he'll lose. be quick, too, to dodge both and get in a clean shot. Man's direction. He'll then simply keep repeating the same pattern. to last long against this guy. immobilized, he'll use his hard knuckle attack to KO him. he'll go halfway to throw Mega Man off. to pull Mega Man towards him. ground, Mega Man is bound to crash into him several times. All sounds and images are copyrighted by their rightful owners. Choose the game you would like to hear the music to. games many years ago were the songs on each level. these feelings towards the games and their music. games today, their impact is undeniable. PathsArePostScript (25) Timeline Frame 1 0 bytes ""